In 2017, Bret Eynon and Laura M. Gambino released High-Impact ePortfolio Practice, which drew broad acclaim from faculty and educational leaders. “An instant classic,” wrote one reviewer. “The book I’ve been waiting for!” exclaimed another. With compelling evidence of the impact of ePortfolio “done well,” and a practical framework for educators to follow, this research study quickly led to the formal recognition of ePortfolio as a validated High Impact Practice. Now, with Catalyst in Action: Case Studies of High-Impact ePortfolio Practice, Eynon and Gambino have taken the next step. The book offers 20 powerful case studies, drawn from campuses ranging from Bronx Community College to Yale University, from the University of South Carolina, to Dublin University and Arizona State. In High Impact ePortfolio Practice, Eynon and Gambino outlined the Catalyst Framework, spotlighting the strategies needed to launch, build and sustain a “high-impact” ePortfolio practice. Linking integrative social pedagogy to technology, assessment and professional development, the Catalyst Framework offers guiding principles and classroom-based ePortfolio practices that improve student success, deepen the student learning experience, and catalyze learning-centered institutional change. In Catalyst in Action, teams of faculty and college leaders detail their experiences exploring and testing the Framework on their campuses. Working with diverse groups of students in a broad range of disciplines and settings, the case study authors put Eynon and Gambino’s integrative strategies into practice. Catalyst in Action shares their findings and their insights. As higher education enters a challenging new era, it must find new ways adapt and change, to support and demonstrate student growth and development. Catalyst in Action is a powerful combination of intensive research and practical experiencing. Offering exciting new evidence and fresh new insights, Catalyst in Action will be an invaluable resource for those who wish to build student success, advance higher learning, and meet the demands of the 21st century. “Catalyst in Action makes a compelling case that ePortfolios—when made central to degree programs and to students’ educational development—spur transformative redirection and new connections across both of these conceptions of student success: degree or credential completion and students’ demonstrated development of capacities needed and rewarded in the world beyond college. As Catalyst persuasively shows, ePortfolio practices help students develop capacities such as purposeful inquiry, mindful reflection, and the intentional integration of learning from different contexts, both school-based and experiential. Students who engage in these practices graduate better prepared to both apply and continue their learning in their roles beyond college. 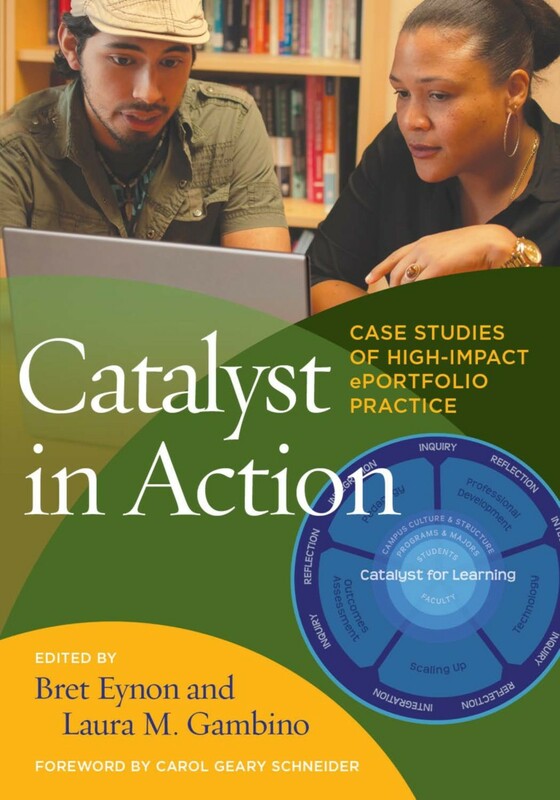 "Catalyst in Action is the rare book that goes beyond lessons learned to show how ePortfolios address some of the most pressing issues in higher education today. From Carol Schneider’s brilliant prologue through Eynon and Gambino’s masterfully cultivated case studies, readers will emerge with fresh insights and renewed inspiration to take on key challenges. ePortfolios may just be the highest-impact practice of them all." "The vibrant Catalyst case studies, drawn from a wide variety of institutions, are evidence that the ePortfolio is one of higher education’s most creative and adaptable innovations. This book is a must-read for anyone interested in using ePortfolio practice to improve teaching and learning across academic disciplines." "High-Impact ePortfolio Practice was for me an epiphany. I knew of ePortfolios as powerful drivers of student learning and reflection, but hadn’t thought of them as a way to strengthen and integrate entire institutions. I’ve been evangelizing for Eynon and Gambino ever since, but I also know the Catalyst model can seem almost too ambitious. How would you even start? Catalyst in Action shows us how, with real-life case studies from colleges and universities at all stages of ePortfolio implementation. And this is no whitewash: each one is clearly situated on a scale of maturity, so you can zero in on those in a context like yours, and find your next steps." "Done well, ePortfolio is an engaging, high-impact pedagogy unmatched in terms of its promise for documenting and deepening student learning. The instructive examples in this timely volume show how different types of institutions are delivering on this promise." "In this intelligently-framed collection, Bret Eynon and Laura Gambino help us understand why ePortfolio is so vital to the future of higher education. With knowledge changing more rapidly than ever before, our challenge is to continually integrate new and familiar knowledge and apply it to one’s life. Integrative learning is the answer. Catalyst in Action is an invaluable contribution to higher education worldwide, crucial for faculty and administrators seeking to shape more integrative institutions and learning designs." "Catalyst in Action renews the ways we think about teaching, learning and assessment. Developed around a shared analytical framework that emphasizes Inquiry, Reflection and Integration, these essays offer indispensable guidance, strategies and principles to faculty and institutions seeking to unleash the transformative power of ePortfolio practice." "Catalyst in Action provides rich insights from the experiences of institutions who have invigorated their student success infrastructure through strategic integration of ePortfolio. As a college president and national career pathways coach, I believe the Catalyst Framework has broad implications for college redesign efforts like Guided Pathways, which seeks to engage students in their learning journey on an academic pathway that facilitates personal and professional growth. Eynon and Gambino have done it again!" "Every powerful conceptual framework has to be both explanatory and generative. In their first book, High Impact ePortfolio Practice, Eynon and Gambino demonstrated the explanatory power of the Catalyst framework. In this volume they demonstrate the Catalyst framework’s generative power, providing a roadmap for campuses that are serious about creating coherent and effective approaches to student success, quality of student learning, and integrative institutional change. This volume not only beautifully models the very process of Inquiry-Reflection-Integration that it espouses, but shows what powerful learning design and assessment in higher education can and should be." "In Catalyst in Action, there’s something for everyone interested in ePortfolios, whether you’re leading First Year Experience at a community college, teaching a Capstone course at a research university, mentoring Study Abroad or shaping graduate students’ professional journeys. The detailed, well-written, and well-researched case studies provide guidance—and inspiration—for using ePortfolios to deepen learning at all stages of higher education and beyond." "The case studies in Catalyst in Action go beyond innovative recipes for integrative student learning. The highlighted ePortfolio practices align classroom and co-curricular learning in ways that demonstrate gains in both holistic student development and institutional effectiveness. Eynon and Gambino deliver an ePortfolio resource that should inspire mutually beneficial professional development collaborations across University offices of Academic and Student Affairs. You’re going to want to buy a second copy to lend to a colleague!" "What is most striking about this volume is its focus on meaningful work. In a national education context that stresses results over process and answers over meaning making, it is essential to have revolutionaries like these authors who reclaim the centrality of a meaningful life as a goal in education. While there is a focus on the reflective self, there is also a focus on the self-in-the-world – one’s connectedness and one’s responsibility to make a difference." "This is an ASTOUNDING book. Eynon and Gambino show why and how ePortfolios not only deepen student learning but also radically empower students’ sense of who they are and what they’re capable of. Next, a broad range of detailed case-studies provide faculty from any institution with powerful tools for changing the academy. Wow. Just, WOW." "Educators seriously interested in underscoring what is most important about higher education—encouraging students to ask “big questions” about academic goals and life aspirations, deeply reflect and integrate what they have learned—will find valuable lessons in Catalyst in Action. Rich studies from 20 campuses illuminate the promise of ePortfolios to facilitate deep learning, promote student success, and help students build a bridge to life after college. A high-impact practice in their own right, ePortfolios have the potential to help all students make meaning and facilitate connectedness, adding significantly to the value of their degrees." "These hands-on case studies bring forward the excitement, accomplishment, and joy of student-centered learning through the ePortfolio, a linchpin for pre-professional and liberal education. A necessary and timely guide for organic, assessable 21st century institutional change, Catalyst in Action provides the data-driven “how to” for ePortfolios to develop fully as High Impact Practices across the boundaries of institutional and curricular silos. A must for faculty and administrators on all levels of higher education." "Eynon and Gambino have compiled an impressive collection of stories highlighting the spectrum of ePortfolio implementation approaches across diverse institutional contexts and tailored to meet the needs of specific students and programs. The value of the Catalyst Framework design principles and practices is underscored in each case study, representing both a theoretical roadmap for how to create a successful plan for ePortfolio adoption but also providing concrete and compelling evidence of ePortfolio 'done well.'" "The great challenges facing higher education today include quality, affordability, and completion/attainment. Of those three, quality is the most complex to address and to measure. Higher education is in desperate need of research-based best practices to help us achieve quality learning, and this book provides such practices with extensive detail so that readers can apply these practices in their own context. Catalyst in Action is essential reading for those pursing quality learning on their campus." "Eynon and Gambino bring together a wealth of practical case studies on high-impact ePortfolio practice, examples of a transformative educational practice that also helps institutions and students make the case for their diverse and varied learning – much needed in today’s accountability environment. Catalyst in Action shows how institutions and those within can move to an integrated learning approach with the student at the center, impacting educational organization, learning design, support structures, assessment, and pedagogy." "High-Impact ePortfolio Practice offered a research-informed approach for true student success – quality learning plus completion. Catalyst in Action follows with 20 case studies, sharing insight and inspiration from diverse ePortfolio implementations. Carol Geary Schneider’s compelling case for fully integrating liberal learning and practical skills development is bookended with Eynon and Gambino’s powerful epilogue, offering higher education a much needed pathway to curricular coherence, driven by student narrative. Essential reading for all interesting in meaningful learning and institutional change." "If your goal is to explore an extensive range of actual ePortfolio practices, learn how they have evolved over time and envision the challenges and opportunities on the horizon, then this review of 20 richly illustrated case studies is just what you need!" "Compelling and filled with practical advice and specific examples, Catalyst in Action addresses an essential need in our quest to advance quality and equity in higher education. Eynon, Gambino and the other authors paint a powerful picture of how effective well-designed ePortfolio programs can help today’s students chart their learning journeys, improve their attainment of key skills and abilities, and eloquently tell their own stories of what they know and can do as a result of earning their degrees." "Spread the word! For those of us who struggle daily in search of a guiding educational framework that elegantly integrates the micro-meso-macro contexts of campus learning environments— Catalyst in Action is the text to read. For those of us interested in authentically resolving the seemingly elusive goal of bridging authentic equity work with high quality learning environments—Catalyst in Action is the text to read. For those of us in campus contexts fraught with siloed academic learning environments, seeking a wealth of applied knowledge backed by grounded data from diverse institutional case studies--Catalyst for Action is the text to read. Eynon and Gambino have masterfully pulled together diverse institutional case studies that will nourish a more robust and integrative conversation on our campuses about the critical impact ePortfolios can have in assuring equitable, engaged, high learning environments—for both students and faculty. For those seriously looking to advance campus conversations and actions on equitable high quality learning environments—Catalyst for Action is the text to read!" "At last, Catalyst in Action takes a wide range of case studies to demonstrate that eportfolio is not about a technology, but about students recognizing and articulating themselves as educated people and the worth of their learning; faculty being able to see more of their students succeed; and institutions retaining and graduating students with quality credentials employers, society and individuals need to flourish. Eportfolio skeptics have a harder time now arguing for delay and resistance." Bret Eynon is a historian and educator, and serves as the Director of the LaGuardia Center for Teaching and Learning. Laura M. Gambino is a Professor and the Faculty Scholar for Teaching, Learning, and Assessment at Guttman Community College.